Not a race report but a volunteers report this time. 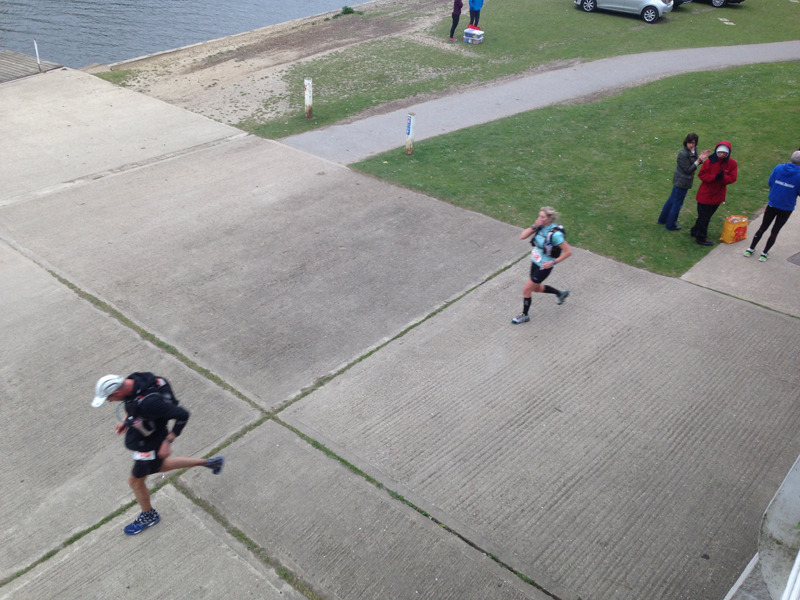 I had run the Centurion Running Thames Path 100 in 2012, 2013 and 2014 but decided against it this year having run The Oner in April and with the GUCR coming up at the end of the month. However, this did give me the opportunity to lend a hand at the event and after volunteering some months ago was assigned Aid Station duties at Reading which was perfect as it was close to home… and indoors! The Aid Station was due to be open from 5pm and a small group of us (Myself, Susie, Shaun, Jacqui, Amanda and Lily) had been emailed instructions and duties a couple of weeks before and were asked to be there for 4.30pm in time for any lead runners. I hadn’t met the team face to face before so it was great to catch up and meet some new people on the day. We there a little earlier and started setting up tables and preparing fresh food before the Centurion setup van arrived with further food supplies and equipment which we set up. 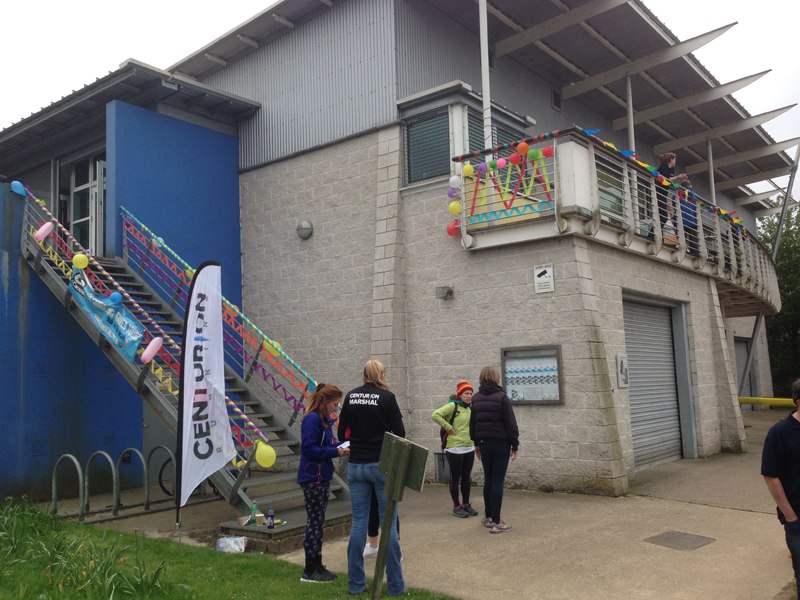 There seems to be an increasing trend of decorating or having a theme for each Aid Station at Centurion events and therefore we also made some effort to decorate the stairs up to the Reading Aid Station (which we know people love so much especially 58 miles in the race!). We also decorated our self styled “Motivation Station” with a number of posters recounting various popular ultra running memes (thanks largely to @memesultra) and a few we came up with ourselves. Once that was done it was waiting time for the lead runners. 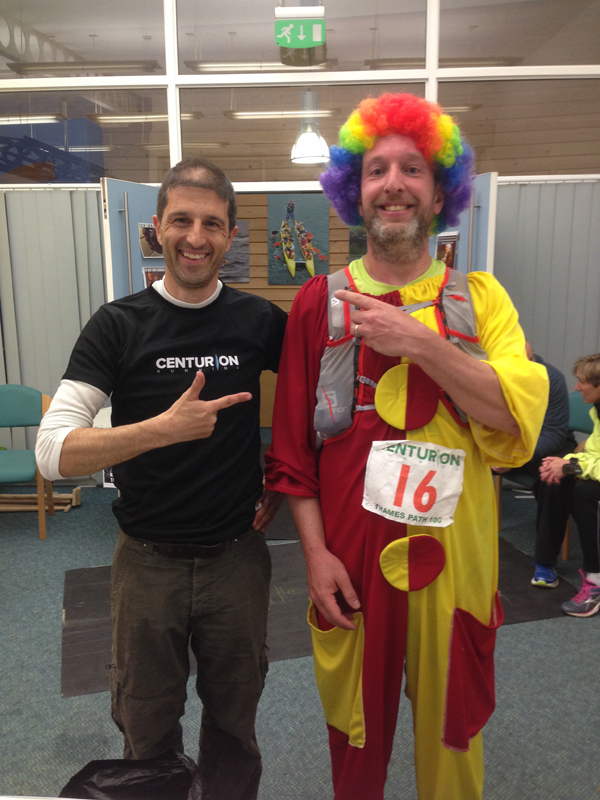 Reading was a crew meeting point so we had a few support crews start to drift in and out along with a few pacers. It was after 6pm when the lead runner Max arrived to meet his support crew and another 20-30 minutes or so before the other runners started to arrive. It was great to see Nick Greene (2nd overall) and Sally Ford (4th overall, 1st lady) doing so well and running strongly when we saw them. I was a little envious of the runners at first and wanted to be out there running (I suppose partly due to this being the first Thames Path 100 I hadn’t run and its a local and familiar event) but these feelings passed when it got a little colder, wetter and later into the night! As the evening progressed and the light gradually started to fade the frequency of runners started to increases and we would follow the organised pattern of welcoming and checking the runners in; updating the results manually and electronically; having a word with the runner and checking they were ok; topping up bottles and bladders; offering some food or hot drinks and then encouraging them to leave the Aid Station with a cheer or applause (and reminding them to head over the bridge ahead and to expect a diversion of the path ahead). Our peak time was between 10pm – 12 midnight when we were rushed off our feet for a couple of hours with the bulk of the runners arriving at this point but we worked effectively to ensure that food was available, bottles could be topped up and hot drinks were available. It was great to see lots of familiar faces and meet a few new ones on the way albeit very briefly as people were on a mission. The weather took a turn for the worse as it had started to rain during the evening meaning people were colder, wetter and a little bit more miserable. 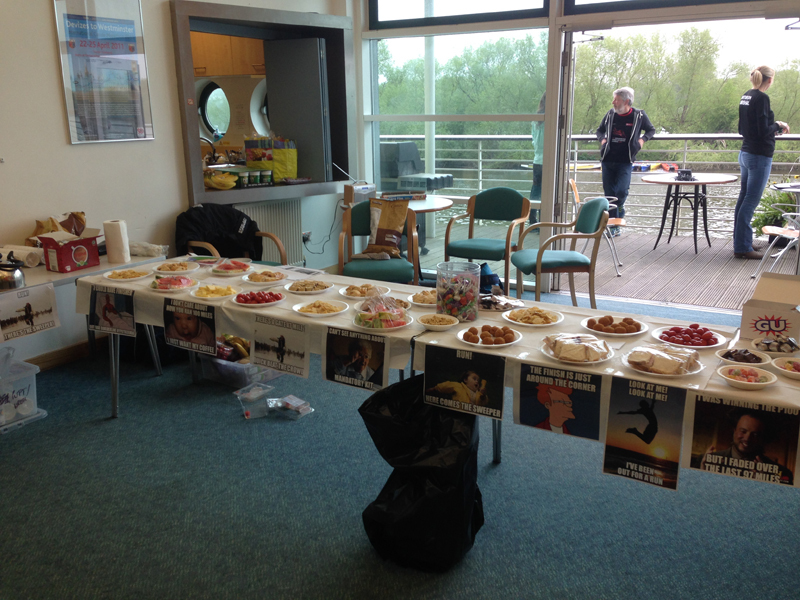 The Reading Aid Station was due to be open until 2.30am, so aswell as the runners we had to ensure all of the volunteers were fed and watered and happy during the shift and we swapped around a few duties to give people a bit of a break and change from time to time when required. The team were excellent with everyone working diligently to assist and support the runners and everyone showing some initiative to check food and supplies were always topped up, great job team! We had some additional assistance from another volunteer Andy (a friend of Susie/Shaun) who came along to help. It’s interesting to witness the different runners and their state of minds as they pass through the Aid Station. Reading was positioned at the 58 mile point so a long way to go and many people would be reaching us mid to late evening with a long night ahead of them, so a point where you could experience a few drop outs. We saw a number of people which ranged from the ‘quick in and out’, the ‘jolly runner’, the ‘miserable runner’, the ‘running friends who weren’t quite so friendly at that point’, the ‘sarcastic runner’ (oh joy, look at those stairs I have to climb), the ‘injured runner’, the ‘I need to check my plan’ runner and so on which was all simply representative of their physical condition and state of mind at that point (and not necessarily their personalties). The team interacted with the runners with efficiency and good humour and we continued with our efforts to look after people and move them on. As we got past the peak of the runners it started to get a little quieter and we started to see a few drop outs. We had been expecting this and did our best to try and encourage them to get to the end especially when one (maybe two) indicated they had been going for the Grand Slam but had to drop out. If we could encourage just one person who was going to drop to finish then I think we’ve done a good job. Unfortunately it doesn’t always work out when one chap (whose name I forgot, apologies) bravely left our Aid Station carrying an injury but returned a short while later when he realised it just wasn’t going to happen in his current physical state. Bravo sir, for giving it a go. 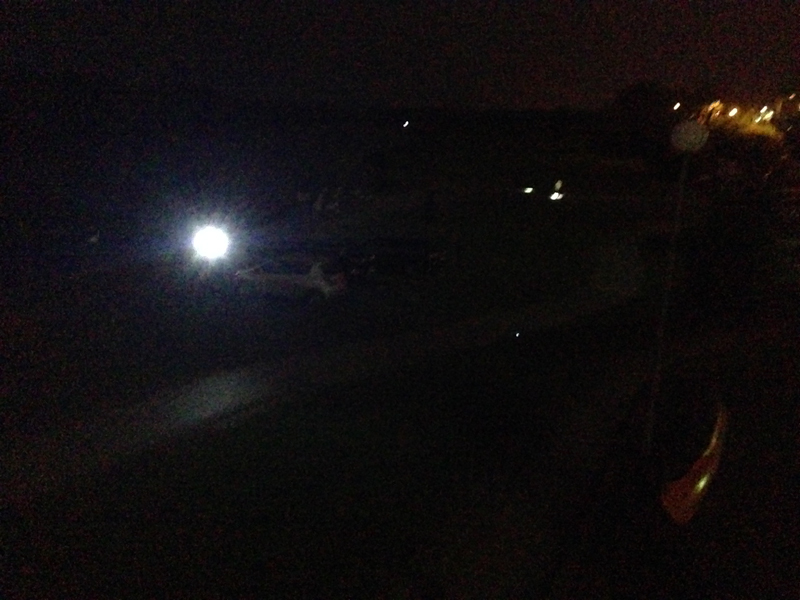 We started to amass a few runners as we progressed into the early hours. A few didn’t have any kit or drop bags and called taxi’s or friends/family of a lift whilst a few waited it out for the pick up coach which trundled through the Aid Stations. The atmosphere had been pretty good all night with all of the runners seeking to encourage each other at the Aid Station which was nice to see. 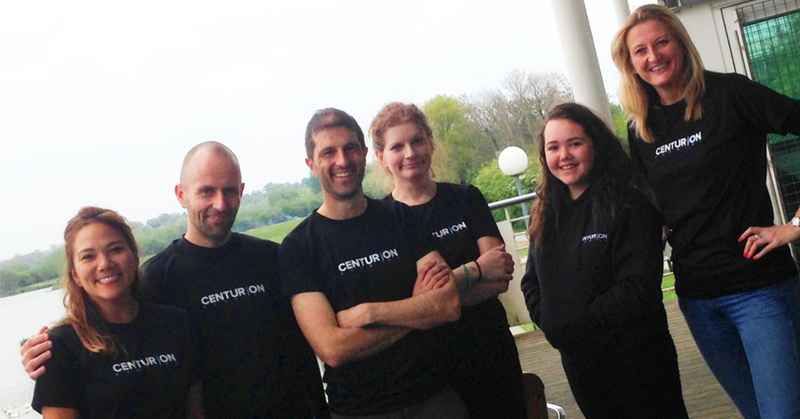 The Centurion clean up crew arrived in the early hours and we started a little bit of the ‘behind the scenes’ clean up operation whilst still ensuring that food, water and hot drinks were available for any of the back of the pack runners. It was time to say goodbye to everyone, lock up and go home. For us it was a good experience and great to help out and a job well done to the team. For the runners, well they still had a few hours and a lot of miles to cover! Well done to all the runners who took part, particularly those who made it to the end. The Thames Path 100 has the reputation as an easier 100 miler due to the flat terrain and relatively simple navigation however I think there has been a significant proportion of drop outs in each of the four years it has been running (first two years could be heavily attributed to the really poor weather) and it just goes to show that covering any 100 mile non stop race on foot is a demanding physical challenge. 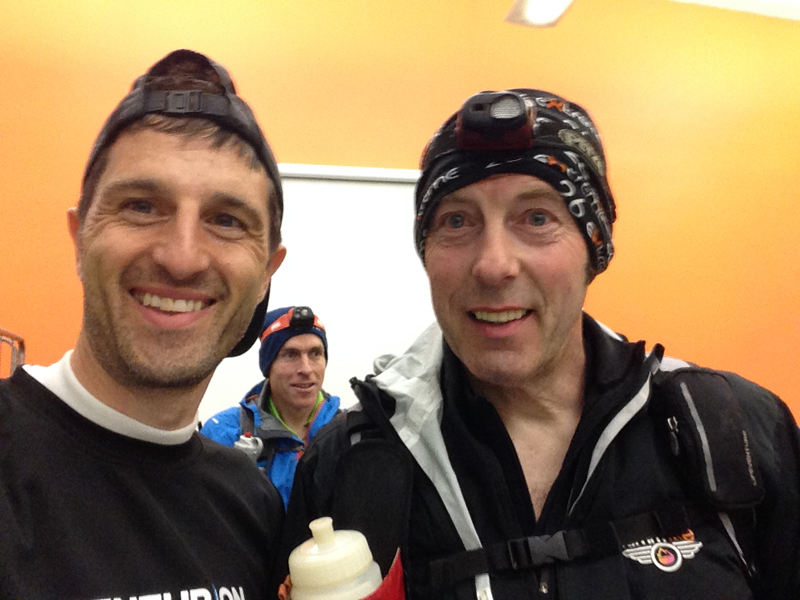 Finally, it’s been great to catch up on the various blogs and race reports from people who we saw pass through our Aid Station and read of their experiences and ideally their success at getting to the end. Well done to all the runners! On behalf of the team, we were happy to play a small role in supporting the event. Loved the welcome and the motivational posters – can’t remember what a single one said, but they amused me at the time. And I believe your impromptu volunteer was @windsorandy.